Dubai, UAE, 24 July 2018: 007 ELEMENTS, an exciting new James Bond experience built inside the summit of the Gaislachkogl mountain in Sölden, Austria, is now open to the public. The cinematic installation was opened by actress Naomie Harris who plays Moneypenny (Spectre, Skyfall) and Jakob Falkner Managing Director of Bergbahnen Sölden. 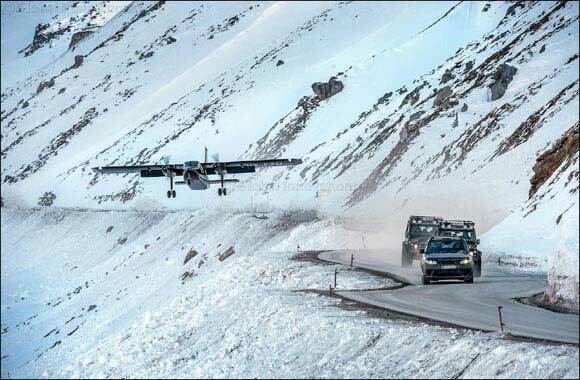 Visitors can learn how the thrilling action sequences in Spectre were filmed in Sölden and see interactive displays with Jaguar Land Rover technology. The iconic Land Rover Defender driven by villain Hinx’s henchmen is situated on the cliff edge and the Range Rover Sport SVR driven by Hinx (Dave Bautista) is also on display. The latest Jaguar Land Rover technology is on show with features from the all-new electric Jaguar I-PACE performance SUV and artificial intelligence systems. Jaguars and Land Rovers have appeared in nine Bond films since 1983, when Roger Moore’s Bond escaped in a Range Rover Classic convertible driven by Bianca (Tina Hudson). Laura Wood, Head of Brand and Partnerships at Jaguar Land Rover, said: “We are very excited to reach the 35th anniversary of the collaboration between Jaguar Land Rover and the Bond franchise. At more than 3,000m above sea level, 007 ELEMENTS is the highest experience of its kind taking visitors on a journey through nine galleries and a plaza with stunning Alpine views. The dramatic spaces complete with an immersive soundscape showcase the fundamental elements that define the James Bond films – placing visitors inside the world of 007 and revealing how that world is made.